Dominique P Germain is Professor of Medical Genetics at the University of Versailles (UVSQ), the Director of the Research Unit “Biotherapies of Fabry disease” within the Unité Mixte de Recherche (UMR 1179) Université de Versailles / INSERM (Health and Medical Research National Institute) located at the UFR des Sciences de la Santé (Montigny), and the Head of the Division of Medical Genetics at the Raymond Poincaré Hospital (AP-HP). He is also Director of the French Referral Center for Fabry disease in Garches, France. 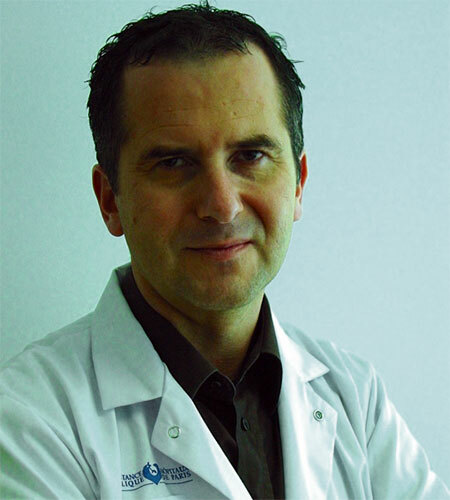 Professor Germain graduated in medicine, from the University of Nancy I, France, and went on to specialize in dermatology at the University of Nancy where he received his doctorate in medicine (MD). He then completed a doctorate in human genetics (PhD) at the University Paris VII (Denis Diderot) France, which he obtained in 1999. He obtained his Habilitation (Habilitation à Diriger les Recherches, HDR) in 2005 from the University Paris V (René Descartes). Professor Germain was a lecturer in medical genetics at the University of Paris V from 1996 to 1998 and at the University of Paris VI from 1999 to 2001. He has been appointed Professor at the University of Versailles – St Quentin (UVSQ), France, in 2007. From 1998 to 2000, he was a consultant in the Department of Genetics, at Broussais Hospital, Paris. In 2000, he moved to the Georges Pompidou European Hospital, Paris, where he was Head of the Division of Clinical Genetics. In 2006, he was appointed Director of the Referral Center for Fabry Disease and Hereditary Diseases of Connective Tissue by the French Ministry of Health, a position which he has kept ever since. The Excellence Center for Fabry disease label was renewed in May 2017. Since that date Prof. Germain is also the Director of a center of expertise for developmental genetic diseases and congenital malformations. Professor Germain’s research interests include the clinical and biochemical genetics of Fabry disease, Pompe disease and hereditary diseases of the connective tissue, such as pseudoxanthoma elasticum, and mucopolysaccharidoses. He has a strong interest in enzyme replacement therapies, chaperon therapies, dysmorphology, genetics of inherited metabolic diseases and neuro-muscular diseases, and clinical exome sequencing. Throughout his career, Professor Germain has contributed extensively on the topics of Fabry disease and hereditary diseases of the connective tissue. He has written several book chapters and has published over 130 peer-reviewed papers, most of them as a lead or senior author including publications in The New England Journal of Medicine (August 2016) and The American Journal of Human Genetics. Professor Germain is responsible for the teaching of Human Genetics to the medical students at the University of Versailles.